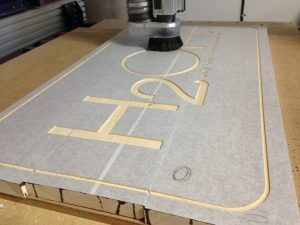 The HearMe Kiosk’s mold was carved out of MDF and then vacuum formed in plastic. ‘HearMe’ Interactive Kiosks created for Carnegie Mellon’s CREATE Lab’s Hear Me initiative in collaboration with Laser Lab Studio, a company he often works with. 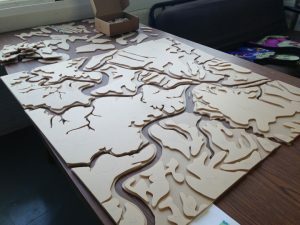 So Dan returned to Pittsburgh and increased his CNC skills. 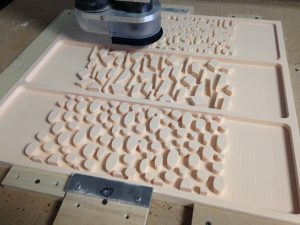 He freelanced on the side while working for a company that introduced him to 3D printing and laser cutting. 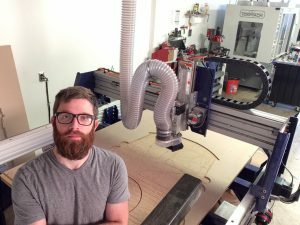 A light bulb went off: He dove into learning all the software needed to run a laser cutter and other CNC machines. Dan picked up more freelance jobs, more tools, and finally felt comfortable leaving his 9-5pm job. Visionary Effects was born. “My goal has always been to grow slowly and naturally,” Dan says. Moving out of his basement studio and into a shared studio space allowed him to take on larger jobs and to collect more tools. He needed a CNC machine to cut aluminum and other materials for animatronic pieces. “I needed something I could afford to get up and running quickly. I was looking for a used machine and got lucky that someone put up their PRS Standard 4×4 on Craigslist,” Dan says. While most begin with wood, he started cutting aluminum and other alternative materials right out of the gate. 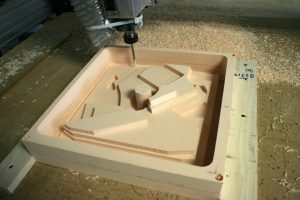 With a little trial and error mixed with a little research on the Talk ShopBot forum, he was off and running. “My industry is so variant that I don’t have the luxury of only cutting one material,” Dan explains. 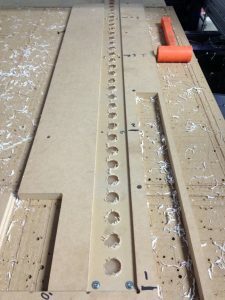 “One month is heavy steel fabrication with cutting and grinding and next month is doing a museum project.” He utilizes interchangeable custom dust feet with magnetic heads for cutting 1/8” aluminum versus 3” thick foam. Like most projects tackled, “I spent way too long customizing them,” Dan laughs. 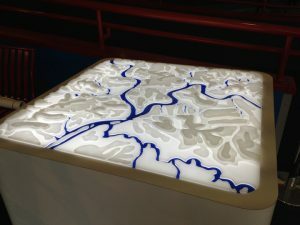 Dan recreated ‘How People Make Things‘ exhibit for the Museum of Discovery in Arkansas based off of decade-old AutoCAD files. With no details in the drawings, design and assembly decisions fell to him. “The company that originally created the traveling exhibit for the Children’s Museum in Pittsburgh went out of business. So there was no one to call to ask for help,” remarked Dan. Over the years, Dan’s PRS 4×4 aided him not only in his design/build business. “Animatronics is such a small industry that it is difficult to find others who are doing exactly what I’m doing,” he says. The first projects he freelanced on were animatronic eye mechanisms. Drawn to this type of work during school, CGI has overshadowed this industry. “With animatronics, there’s no how-to guide and there’s only a few people in Hollywood still making these. It started out as a personal project … how to create the smallest, most real-looking eye mechanism,” Dan explains. The limitation rests on fitting the number of servos needed into the smallest space. Posting YouTube videos of his eye mechanism tests showed that others were trying, too, but they didn’t have the resources. A new business arose: He began offering his hand-painted eyes as fully assembled kits, using his ShopBot to hone the aluminum plate design. Customers expanded to China, New Zealand, Netherlands and Spain just to name a few. The eye kits plugged into whatever control system the user needed whether it was a simple radio controller or a complex computer controlled playback for a robot. 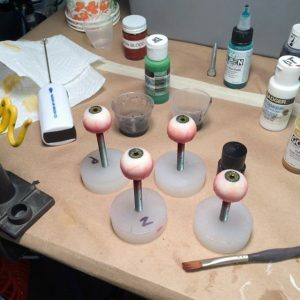 Dan hand paints all of the eyeballs used in his animatronic eye kits, which he sells to film and tv companies as well as hobbyists. One of many challenges lies in getting all parts needed to fit into a small space. Adjusting for limitations is part of Dan’s day-to-day work. A few years ago the University of Pittsburgh Medical Center’s marketing department contacted him about a new heart disease campaign. 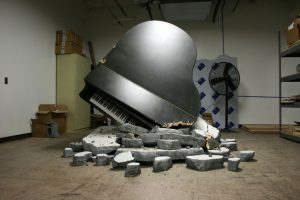 “The tag line was something about the chances of a piano falling on your head compared to the chances of having heart disease,” Dan remembers, “They literally wanted a piano to look as if it had fallen from the sky.” The installation needed to pack up into 2 crates, to be mobile and travel, to fit through a regular size door and to be light. All seams and hardware had to be hidden. 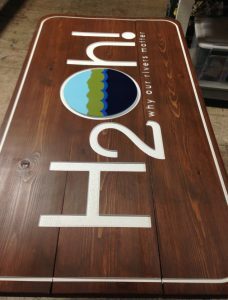 Dan’s completed fallen piano traveled to Pittsburgh hotel lobbies, malls, and office buildings. “The clients were really pleased. And I learned a lot about pianos!” Dan laughed. University of Pittsburgh Medical Center’s Marketing team hired Dan to create a piano that fell from the sky for a heart disease campaign. The installation had many design limitations: Mobility, weight, and assembly just to name a few. It traveled to various locations around Pittsburgh. 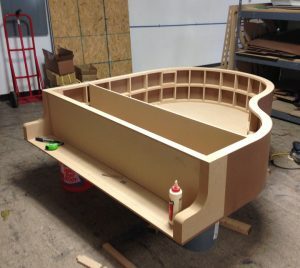 Dan utilizes 1 if not 3 different CNC machines along with traditional tools on all projects. He’s let the natural progression of Visionary Effects dictate his equipment purchases. 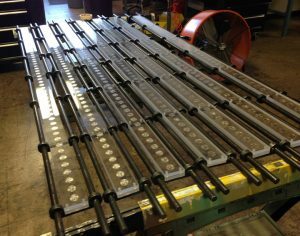 Adding additional side rails transformed his ShopBot 4×4 into a 4×8 machine. Also in his shop is a Rabbit Laser USA, a Tormach mill and most recently an Ultimaker 2. “I don’t do production. Mine is usually at most 100 of something. So my machines let me do everything I need to do,” says Dan. Project after project shows Dan’s fearless attitude towards design and fabrication challenges and faith in his skills as a maker. No doubt we will continue seeing great things coming from his interdisciplinary studio.